Growing up in Seattle, my papa and I took numerous exploratory trips through the bowels of this schooner. My favorite part was stuffing myself into the crew quarters and trying out the bunks. For the record, I'd probably never make it as a deckhand, if one had to sleep in one of the Wawona's berths. I'm bummed that she's heading off to the junk yard but I suppose not every wooden ship is salvageable. Northwest Seaport gave it a jolly good attempt, though. The iconic, 111-year-old schooner Wawona left shortly after 8 this morning for its final voyage. The iconic, 111-year-old schooner Wawona left shortly after 8 this morning on its final voyage. It was maneuvered by two tug boats from where it had been moored on South Lake Union to the Lake Union Dry Dock Company, on the east side of the lake. The 165-foot vessel will be taken apart, with some parts preserved for a future exhibit at Lake Union Park. 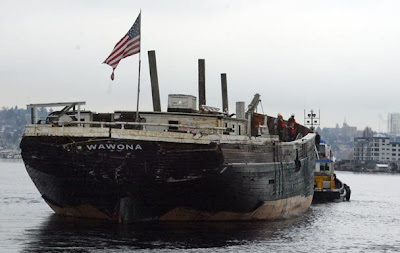 The Wawona, which left its place on South Lake Union at 8:15 a.m. today and arrived at the dry dock at 8:55 a.m., was built to haul lumber from this state to California. It later became a fishing schooner and during World War II was an Army barge. Over the years, there have been various efforts to save it. But, said Joe Shickich, president of Northwest Seaport, which owns the vessel, time and weather ultimately took their toll on the wooden ship. Its timbers rotted, opening the door for beetle infestation. "It's a bittersweet day," Shickich said. "She's moving to the next stage."